Yuasa is a recognized leader in rechargeable sealed lead acid batteries. 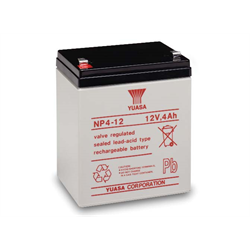 These NP series batteries are commonly used in security & alarm systems, security camera backups, UPS systems and emergency lighting systems. NP series sealed lead acid batteries are maintenance free with a long shelf life, excellent performance and a long service life.